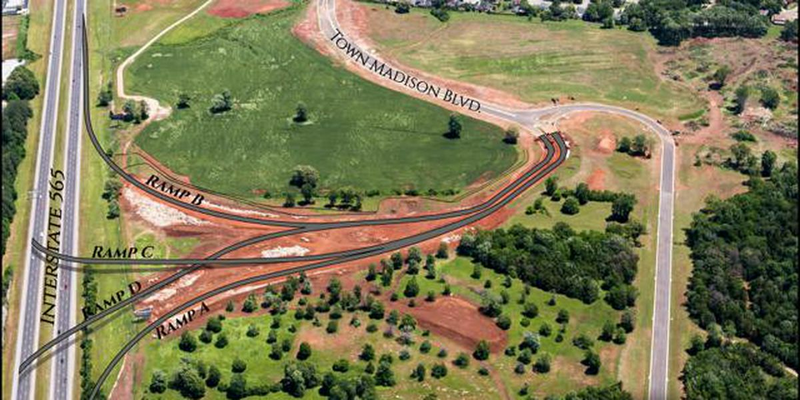 MADISON, AL (WAFF) - Leaders of a $400 million Madison development released the first rendering of a new interchange that will connect Interstate 565 to the major project. Construction on that interchange is also moving according to schedule. The development, called Town Madison, first came to light several years ago when developer Louis Breland announced his intentions to build a retail and living community. The project stretches south of I-565 between Zierdt Road and Wall Triana Highway. The 700-acre site has experienced delays due to environmental studies and reviews coming back at a slower pace than anticipated. However, crews started removing 6,000 tons of rock that had been blasted from the site a few months ago, and Town Madison leaders confirm the work on the interchange is well underway. "The good news is all of that is behind us, dirt has finally started to move, and we couldn't be more excited," said Town Madison's Joey Ceci. "We look to have this whole interchange done by 2018." Ceci also hinted that more announcements on tenants who will be joining the major Madison development could come as early as next week. "People were waiting for this phase. They wanted to see the interchange under construction, they wanted to see how it was going to fit into the project, where they might fit in with the road construction. Now that the roads are essentially here, they can see this interchange and see how it affects them. We're now getting that good traction with folks and in the coming days you'll start hearing names of the first tenants here at Town Madison," said Ceci.